About 100 plastic cases have arrived, and they look really great! I am glad that black has become the color eventually, and that the material looks the way it does. And I am sure that everyone who is waiting for their unit will be satisfied with the case as well! The remaining cases of the batch that are ordered will arrive a bit later. I’ll update you as soon as I know more. Due to the demand, another 100 units (the hardware boards) have been ordered for production and will be ready in about a month, in the end-of-april time frame. iAN CooG Site has been update with some nice stuff. TapClean g20: Modified and enhanced TAP cleaner, added support for some common (in Italy :) turbotapes. CompTAP 1.0: C porting of the TMG compression format for tapes. UNP64 2.20: Generic C64 prg unpacker, original idea and code from Exomizer by Magnus Lind. 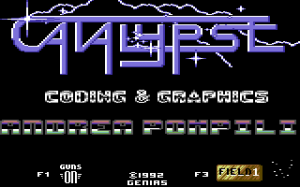 Cartograph is a native Commodore 64 application created for designing tile-based maps/levels. This versatile tool allows you to create maps and levels for your games, matrices and data for demos and tools and much more. New: Support for CartographPC filetypes. New: Sample source code to display full screen map. New: Save character set as part of project file if a custom one is in use. Fixed: Color table was saving 4 extra bytes, these have been trimmed off. February is already drawing to the end, so some news about the 1541U-II is needed here. The good news is: the boards have been produced, and the first few have been tested and are working! They are currently back at the assembly house for a missing connector, but I am expecting them back early this week. The not-so-good news is, that the plastic cases have more delay. The Chinese company sometimes makes some promises that they are breaking afterwards. Yesterday I received a message that the new samples will be shipped on the 10th of March, while they had previously promised to send 100 cases upfront on Feb 25. I pressed them to send at least 100 pieces on, or before that date. 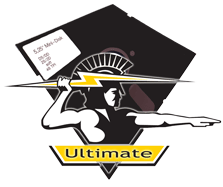 Achim released his game Space Limits II for the Commodore C64. 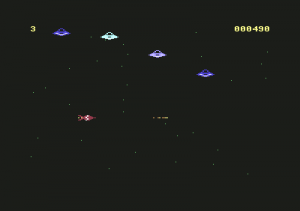 This 4 kbyte game is the successor of Space Limits from 2009. Cartograph V1.3 increases productivity and decreases the amount of time needed to create your data. Some of the major changes include six new fill modes (random and pattern), six more data types, REU support (backups and undo), and RLE compression. Maps created with earlier versions are 100% compatible with this new release. Finally, you might think! An update on the 1541U-II… As time is going fast, the moment that all the hardware parts for the 1541U-II will be ready is drawing near. It all was not too easy, but things are going now the way they should. The major difficulty showed to be the plastic case. Finally I have found a contractor who is willing to make the plastic case exactly as I wanted it, for a reasonable price. Unfortunately, the mould for plastic injection is quite expensive; in fact about double of what I expected initially, based on an unrealistic quote that I got a few months ago. Because of the large interest in the 1541U-II, I decided to just continue with it, and leave the selling price of the total product intact. Earlier this week, I received the first pictures of the first try-outs of the injection mould tool. 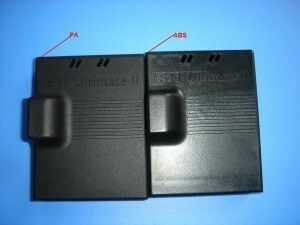 The result shows a little problem in the design, with the planned material (ABS). Due to the thick and sturdy plastic constuction on the inside, sink marks are visible on the outside. The manufacturer has tried to run the case with a different material (PA), which looks a lot better. However, due to different shrinkage characteristics, the mould tool needs to be adapted to adjust for the difference in material. (You can see this, that the matte version does not close perfectly…) They will do this, but it will take one week extra before the cases are ready. The final color won’t be black (unless I am getting a lot of angry E-mails now.. ;-), but light cream color, to match the C64C better. After many years, Resource release a new version of Project One (Converter and Paint program). Andrea Pompili released the game Catalypse v1.1. Version 1.0 was published in 1992 but there the game had some small bugs. Andrea has now fixed the bugs and added a level 2 loading screen. The improved game is now available for download. This shop offers projects for the classical computers Commodore 64. 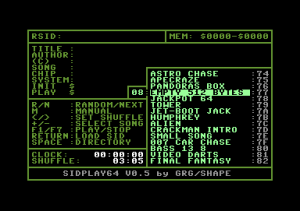 This is a program that can playback sid files from the HVSC collection on a real c64. Fixed the bug with Retro Replay. According to Countzer0 it is indeed a bug that shouldnt be there. Files with not enough relocation pages for siplay64 and with a built in play mode (see sid files with $0000 as play call) will now be loaded and started. Examples here are Pollytracker songs which use all memory. Other files where relocation pages doesnt leave enough memory will still give you the “out of memory error” message. Speeded up the keyboard scanner. You can select things faster now. Added a display number for number of files in dir. After this update, the collection should contain 37,081 SID files! Thanks to all the people who have helped to make HVSC the collection that it is today, without your help it would be a much tougher task. Videoreview about the comparison of “MMC Replay” (Individual Computers) and “1541 Ultimate” with an detailed tutorial about connecting and using. Also it shows some very interesting additional features like using a real 1541 drive together with 1541U.